Instead of accepting those issues, Buddy set out to correct them. With help from his siblings, parents and mentor Collin Kobayashi of 3D Innovations, Buddy’s idea evolved into the Menehune Hat Clip – an accessory that’s piqued the interest of GoPro and helped Buddy’s team of entrepreneurs win first place at the Global Startup Battle at the annual Startup Weekend Honolulu event in November. The team also ranked well internationally, competing with people from 60 countries worldwide. They tied for first runner-up in the Champions Track and second runner-up in the Great in the Making Track, according to the Global Startup Battle blog. 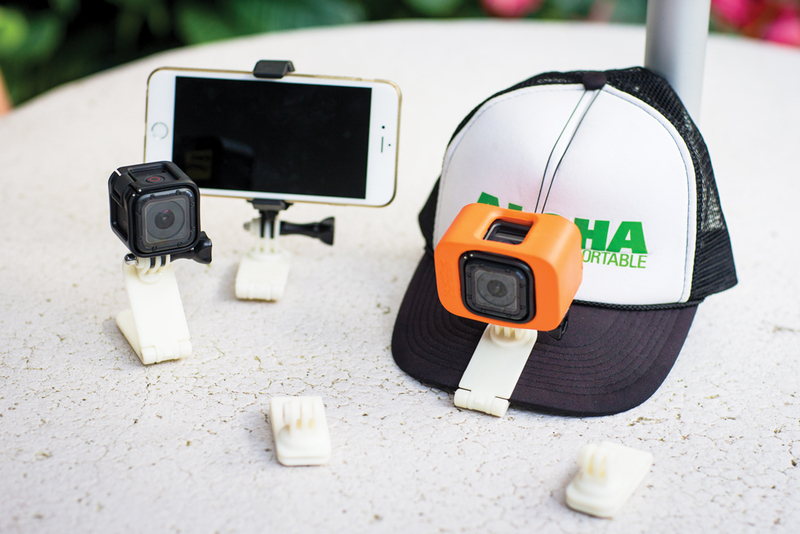 The Menehune Hat Clip is “fully adjustable and removable,” explains Buddy, who demonstrates how the clip – reinforced with magnets – can be clipped to the end of a hat’s bill, attached to metal, hung from a curtain or put on a tripod. It also tackles other potential issues: If it gets swept off by a wave, it floats, and the clip can hold non-GoPro devices, such as a small camera or mobile phone. In addition to Buddy, the “Menehunes” team includes siblings Koko, 10, and Kyndra, 6. Parents Evan and Kari Leong believe that children benefit from learning entrepreneurial skills early. Free time at home may involve watching “Shark Tank,” a reality show featuring entrepreneurs making business presentations to investors, or expanding their knowledge through online courses at Khan Academy. Several schools have programs that promote entrepreneurship, including Punahou School, which all three Leong children attend. But Kari says it helps to have these skills reinforced at home. “Unless parents are taking it on themselves to teach entrepreneurial skills to their children, many don’t get exposed to it unless they’re highly motivated and it’s something they know they want to do,” she says. The kids say they’re up for the challenge. “Our parents are entrepreneurs, so we want to become entrepreneurs, too,” says Koko. Evan, founder of standuppaddlesurf.net, calls himself a serial entrepreneur and is involved in several ventures. Kari is doing doctoral research on whether entrepreneurs are born or raised, and which skills can be taught and nurtured throughout a lifetime. Eager to give their children entrepreneurial experiences of their own, Evan and Kari challenged them to participate in Global Startup Weekend, an event that doesn’t usually attract the pre-teen set. “It’s good that the organizers, especially the organization here, kind of embrace younger entrepreneurs wanting to do something and give them a shot,” Evan says. Since 2009, the Global Startup Battle has been bringing entrepreneurs, developers and designers together for weekend competitions around the world. On the first day of competition, at least two dozen entrepreneurs pitch their ideas and voting determines which 10 are the most promising. Focusing only on those 10, teams then have 24 hours to come up with a business model and a prototype, get customer validation and, finally, deliver a five-minute presentation to the judges. According to Tucker, the Menehunes’ presentation stood out because they had a prototype and business model, and had gone out to identify potential customers. “I thought they did a great job of utilizing multimedia to show their learning,” he adds, noting they used video to help meet some of the judging criteria.